In 2017, the team at our Malabo base in Equatorial Guinea wanted to partner with a local charity to support CHC’s ongoing commitment to the communities we operate in. After vetting a number of options, they selected The Orphanage of Our Lady of the Almudena, a local orphanage that houses 130 orphans and serves as a primary and secondary school for another 600 scholars. Before committing their support, the Malabo team visited the orphanage several times to learn more and make sure they could make a real difference for these children. The budget for the orphanage is always tight, and Sister Marie Cruz and her team regularly have to find creative ways to prevent the children under their care going to bed hungry. Funding of the orphanage generally just covers staple foods like rice and plantain, but there is a large need for better nutrition that includes protein. The first thousand US dollars　the Malabo team donated were spent on milk formula (for the babies and toddlers), and a month's supply of chicken and fish. A website was created to share their story and encourage others to offer support: https://www.angelwingsmalabo.com/. 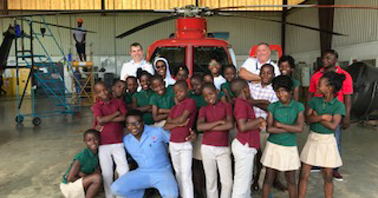 On June 2, the Malabo base invited 20 students, their teacher and a driver onsite to show them who we are and showcase helicopters and aviation. Our team joined MEGI Logistics (the owner of our Malabo base) to provide snacks, drinks, books and support. Like all visitors, the kids began with a safety briefing before touring a few of the aircraft at the base. A few of them competed in a helicopter drawing contest where they were given two minutes to do their best interpretation of the aircraft (along with our own Doug Mitchell.) While the aircraft may have come out looking more like earthworms or bicycles, the students had a blast competing. The event closed with snacks and remarks from the local leaders and the kids left excited, several of them asking about becoming pilots and flying their own helicopters someday. "We were proud to be a part of such an important event for these kids and our local community," said Gabriel Bopa, Deputy Base Manager, Malabo. "We hope we have inspired our visitors to pursue aviation careers and will continue to support them any way we can. We also encourage our colleagues to visit our website to learn more and consider making a contribution towards helping this amazing orphanage."